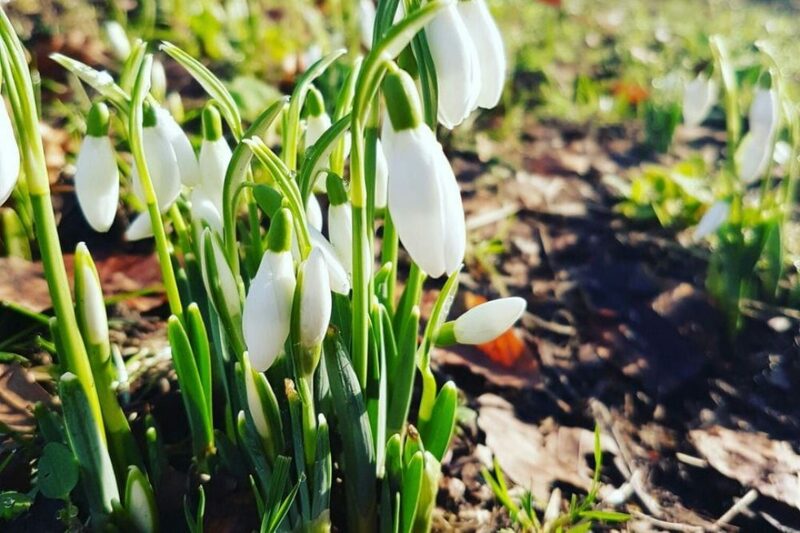 The snowdrop brings a cheerful reminder that spring is on its way, and Hestercombe’s Head Gardener Claire Greenslade explains how and when to plant snowdrops. Already we are seeing the snowdrops popping up in gardens and glades, thanks to a largely mild winter. Snowdrops, or galanthus as they are botanically known, are one of the most optimistic flowers, poking their heads above the parapet in all weathers and announcing that spring is not far away. The snowdrop keeps flowering into March when the other spring flowers are ready to take over. Six years ago a team of Hestercombe gardeners, staff and volunteers planted over 50,000 snowdrops in an area known as Rook Wood. Although some were lost to greedy squirrels there is now have an amazing swath of snowdrops through the trees. The best way to plant snowdrops is ‘in the green’. This just means whilst in leaf and actually it makes life easier as you can see where you have planted. Snowdrops are really good at self-spreading and a few bulbs quite quickly become a good-sized clump which can then be lifted, split and replanted (the next year/season). Wait until the snowdrops have flowered and the foliage is just beginning to die back. This allows the leaves to photosynthesize for as long as possible and means that all that energy has been transferred back to the bulb. Dig around the clump and lift it out of the ground. Depending on your soil you will probably find that you can split the clump into pieces by hand. It is best to replant the new clumps or bulbs straight away. Galanthus bulbs hate getting dried out so planting right away will reduce moisture loss. When you replant your snowdrops, plant to the same depth they were before. You will be able to see this, as any leaf/stem that was below ground will be blanched and white where it wasn’t able to photosynthesise. Firm the plants in and water (well). Snowdrops prefer to be in semi-shade and in fairly moist, but well-drained soil. Make sure that they don’t dry out too much in a hot summer. Follow this simple guide of how and when to plant snowdrops and get planting – it is such an easy way of establishing such a pretty carpet of flowers. Remember that it is illegal to dig up snowdrops in the wild! See Hestercombe’s snowdrops in bloom until March. Find our opening times and prices.